This photo was taken in January 2012 in the mid morning. The location was in front of a hotel that has lots of taxi visits, tour buses, and many visitors that are arriving in Washington DC in their own cars. In other words, a very very busy place. The "Take It" came from the vividness of the colors on this spot on the road that was a little over a foot in diameter. It was near the curb in the street as one can possibly gather from the bottom border of bricks that fronts the curb in this location. The center of it is close to being a circle and the rings of color neatly ringing this circle also makes it an eye magnet. For some reason I suppose that is easily explained these splots of mechanical leakage seem to blossom when there is rain. Since seeing this great example it has rained several times, and of course, I am now ever so much more aware of the way the color comes out having been diluted by the rain and the ensuing seeping. The "least" comes from the awareness this has brought to me to make certain that whenever I now get my car serviced I ask them to make very certain to check that all the seals are not leaking and to make sure that everything that needs tightening gets that proper attention to prevent anything from dripping out and giving us another bit of polution based art. The After Take: It is great fun to show a picture that when looked at almost everyone knows exactly what it is and quickly verbalizes their knowledge. From some there is almost a hint of and what is so photo worthy about that ? tone to their response. My answer is to let them know that it is the near perfection of the shape of the circle, matched up with the strength of the colors, almost rainbow in their variety. The color circles are almost concentric which is also an attraction. It is a short visit to the departure from disgust to seeing the beauty with me having the opportunity to be the humble guide for I let them know I join them in the bottom line dislike of it, and have as my take away, to keep my car up tight. They usually laugh and we have shared another exchange made colorful from a most unexpected source. I am happy to tell you how much pleasure I am deriving from this web site adventure. The showing, waiting for the reactions, explanations, of the pictures is almost always a pleasant and satisfying experience. Hearing views other than my own have left me amazed on numerous occasions; especially when I think I have the best answer, and hear a better one. PS: Humble pie does not have to be made from crow; it can be sweet and shared, even by the server. Hahahahaha, this is classic. I used to have an old school f-150 and I had one of these every day it rained in my drive way. Used to anger the wifey so much but the kids loved it. 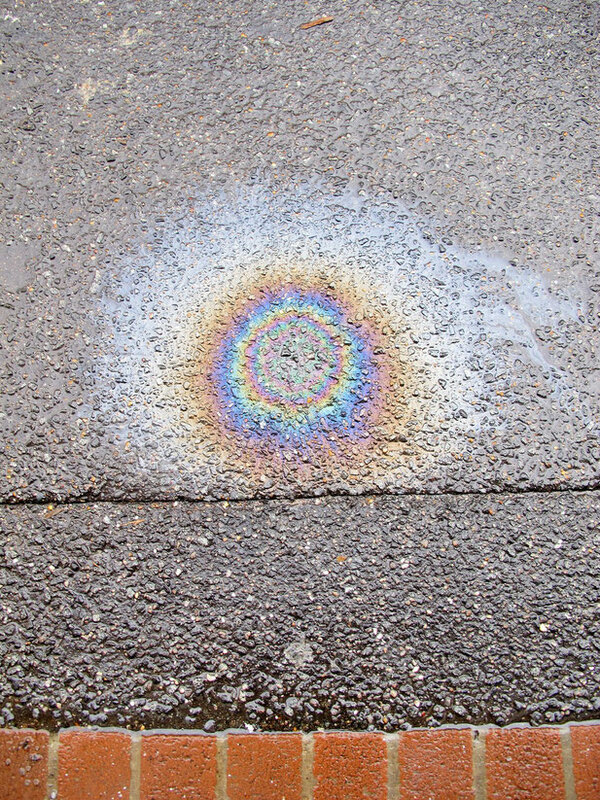 They called em asphalt rainbows. Man this brings back memories! Being a environment lover, as my name implies, I really don't like seeing emissions like these. However I will admit that it does have an almost shameful look of beauty to it. A different form of man made art. Very hypnotic! Staring at the center makes for a great meditation experience. I shall return to this.